The Galaxy libraries offer the range and depth of object-oriented functions needed to build large-scale, mission-critical applications in a client/server or peer-to-peer distributed model. The portable Galaxy API includes over 3500 entry points, organized into class managers. The class managers provide a framework designed around the dynamics of event-driven, distributed applications. 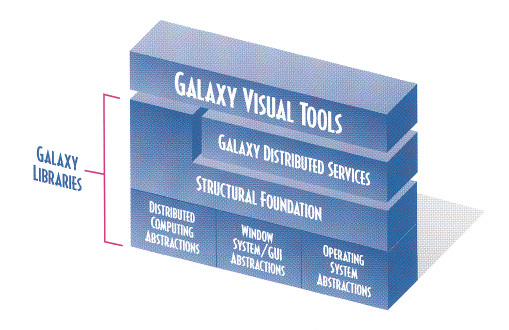 The Galaxy managers can be broadly grouped into four categories: structural foundation, window system/graphical user interface abstractions, operating system abstractions, and distributed computing abstractions. The structural foundation managers are the substrate for building and connecting other Galaxy managers. This logical structure produces a powerful API, yet mitigates the learning curve. The lower levels of Galaxy managers are fully documented, allowing developers to safely customize any Galaxy object to meet specific project requirements. Galaxy’s Object-Oriented Architecture offers unprecedented API depth and breadth to liberate C and C++ developers from the constraints of Platform-Specific toolkits. The Galaxy libraries have been designed and implemented for maximum system efficiency and application performance. Galaxy libraries are implemented as shared libraries or dynamic link libraries to minimize memory overhead. Galaxy application source code is compiled using the native C or C++ compiler and the Galaxy library header files. Galaxy includes both optimized and debugging libraries, to assist the development process. The Galaxy libraries are also compatible with a wide range of third-party development tools, including incremental compiler/linker and interpreter-based tools. Galaxy provides the application developer with over fifty C-based (more in Galaxy/C++) object-oriented classes encompassing over 3500 API entry points, organized in class manager frameworks. Each manager framework provides a consistent approach for working with its methods and data, making Galaxy an extremely productive environment. The class managers access the documented API of the lower-level services in Galaxy. Galaxy objects can be extended without requiring access to the source code for the existing object, using the Galaxy Class Manager for the C version and standard C++ operations for the C++ version. Application developers can adapt any Galaxy object to satisfy specialized needs, with minimal additional coding.